Park Avenue Pizza is located in Downtown Winter Park on Lyman Avenue. Apparently being half a block away from Park Avenue is close enough to use the name. They had several different pies available for pizza by the slice, and I choose one topped with ricotta, spinach, and tomato. The crust was thin and crispy. There were a nice amount of toppings and their flavors melded together nicely. I'd gladly visit Park Avenue Pizza again. I tried a new breakfast/lunch place in Longwood called Max & Meme Cafe. This restaurant took over a former Burger King and although they did some renovations, it is still pretty obvious how the building started its life. The menu consisted of mostly breakfast items along with some sandwiches for lunch. I ordered one of their specials that were written on the space that once displayed Burger King's menu and went with Joseph's Frittata. The frittata was filled with chorizo, bacon, jalapenos, cheeses, and various other ingredients. It was really flavorful and had a nice spice from the chorizo and peppers. Homefries were served as a side, but I personally found them a bit bland. Otherwise, I was pretty impressed with the breakfast menu here. There were items like the frittata that weren't the typical breakfast foods that every other restaurant serves, which is definitely a good thing. The service at Max & Meme Cafe could definitely use some work though. There were a couple of us at our table that didn't get drinks for the entire meal, even with several reminders to our waitress. Service otherwise was acceptable, but extremely slow. Looking at the reviews on Urbanspoon, issues with the service seems to be a common theme at this restaurant. I hope they get their service issues sorted out because their food was good! I was in Mount Dora and decided to get some dessert from a ice cream shop called Operation Deep Freeze. The store is located downtown in a storefront that is covered in fake books. I'm assuming there was a bookstore here sometime in the past. Inside, the place was decorated with lots and lots of pictures of Antarctica. Apparently the owner of Operation Deep Freeze lived in Antarctica on a military base before retiring and opening an ice cream shop in Mount Dora. Operation Deep Freeze does four flavors of homemade ice cream daily. It seemed like vanilla and chocolate were standard while the other two flavors changed. I went with one of the changing flavors and had a cone of pistachio ice cream. There were plenty of nuts and had a great nutty flavor. This was honestly one of the best pistachio ice creams I can remember having in a while! Garden Cafe is a vegetarian restaurant in Orlando that serves mostly Chinese food. The restaurant is located just outside of downtown on Colonial Drive in an old Pizza Hut building. The menu was interesting, with sections for different types of meats regardless of this being a vegetarian restaurant. This initially was a red flag for me, but I got over it. Vegetarians that try really hard to find substitutes to the meats that they no longer eat is something that I can understand, but I wish restaurants like this would embrace their food for what it is rather than pretending it contains meat. Garden Cafe's lunch specials were a good deal. They were a few dollars less than most of the other items on the menu. I had the mixed vegetables in curry. This consisted of zucchini, broccoli, cauliflower, carrots, and mushrooms with a soy based meat substitute that had a similar color and texture to chicken. Brown rice was served on the side. As an omnivore, I really did enjoy this meal. It didn't seem like Garden Cafe was trying to overcompensate for the lack of meat like I've noticed at other vegetarian restaurants, nor did they charge far more than what the meal was worth since it was vegetarian. The flavors were nice and the meal was really filling. I'd gladly return to Garden Cafe. After the demise of Udipi Cafe in Longwood, Garden Cafe takes my top ranking for vegetarian restaurants that I've tried in the Orlando area! 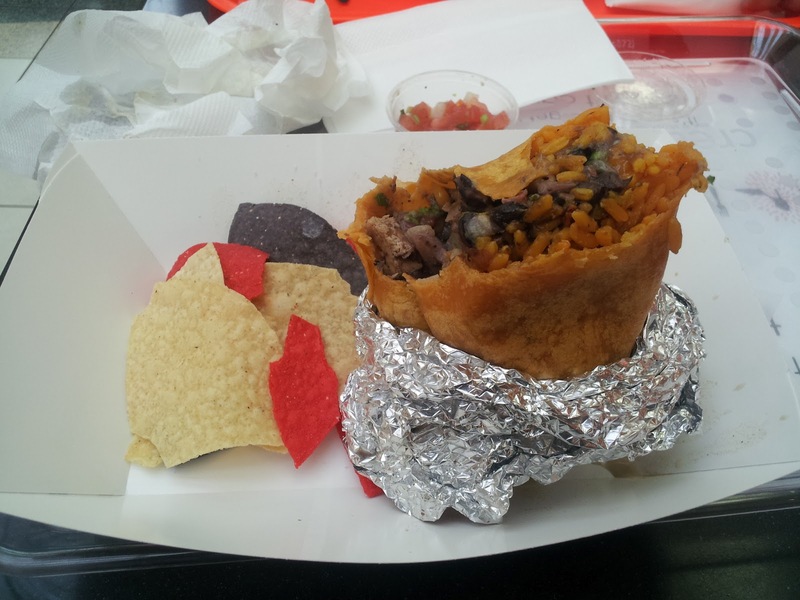 I tried Ancho Burrito Company in the Altamonte Mall food court. This place followed the Chipotle's model where you tell the person behind the counter how you want your burrito filled. I went with a chicken burrito, filled with rice, black beans, lettuce, onions, jalapenos, sauce, and other fillings. The burrito was pretty tasty, although it was really moist. So much so that all the liquid in the burrito soaked through the tortilla and started to fall apart. I think they needed to drain their beans a bit more before putting them in the burrito. Chips and salsa were served on the side. I went with something simple and ordered a pulled pork sandwich with a side of mashed potatoes. The pork was nice and tender and was topped with a squirt of sauce. The potatoes were mashed with the skin, which I always like. Overall, my meal at Wildside BBQ was good. I'd go back here, although next time I'll probably try one of their non-barbeque items on the menu.